Tattoo // Splinter in the Blood!!! - Bookish thoughts!!! Tattoo // Splinter in the Blood!!! First things first: I received this book through jellybooks. I read this back in may but wasn't able to post my review back then. Deswegen kommte ich auch gleich zu den Charakteren. Ruth und Carver, die beiden Hauptcharaktere, aus deren Sicht die Geschichte erzählt wurde. Ich fand sie beide einfach total interessant und vielschichtig und es gibt immer noch so viel, was wir über sie nicht wissen und was ich aber unbedingt rausfinden möchte. Was ich an solchen Büchern auch immer unheimlich toll finde, sind kurze Kapitel oder einfach nur ein kurzer Paragraph aus der Sicht des Killers. Übrigens, ohne zu spoilern, ich hab vollkommen falsch gelegen was den Killer angeht. Wie immer!!!! Ich kann das Buch wirklich richtig sehr empfehlen!!! 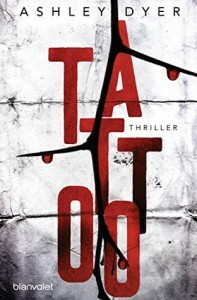 Summary: A propulsive debut suspense novel, filled with secrets, nerve-jangling tension, perplexing mystery, and cold-blooded murder, in which a police officer on the hunt for a macabre serial killer is brutally attacked, and only his partner knows the truth about what happened—and who did it. So let's talk about the characters. Ruth and Carver, the two main characters, from which point of views the story was told. I just thought these two were super interesting and multilayered, and there is so much more what we don't know about them and that I can't wait to find out. What I love about books like that, are short chapters, maybe even just a little paragraph from the point of view of the killer. Also, without spoiling anything, I was so so so so wrong about who the killer turned out to be. Like always!!! !